Pemto is a car that can be found on Joe Groombridge's website (http://joegroombridge.com/art_revolt.html). 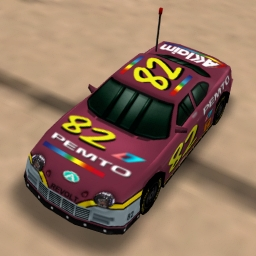 Joe Groombridge was one of the artists that made the original Re-Volt stock cars, but Pemto was never released. The picture on his homepage is the only picture available from this car. StrixMidnight did a great first custom version of Pemto. His version was based on the Humma/SNW35 body. Last year the original Pemto body became available, because the lost car "Mc RC" was found. We used this opportunity, to rebuild the original Pemto as good as possible. The car has a RWD drive and is quite fast for the Semi-Pro class. It has a higher top-speed than Zipper and Adeon, but some weaknesses as well. Pemto doesn't like walls for example - so better avoid hitting them! Also slippery roads are not his favourite terrain. But if you invest some time, you can do some fine results against other cars in this class. Texture and boxart size are matching the classical Re-Volt style (256x256 for texture). There is no HD-version available. Boxart made by RV_Passion. We hope you enjoy Pemto!